Japanese Milk Buns are known for their distinct, milky taste and their soft, melt in your mouth texture. 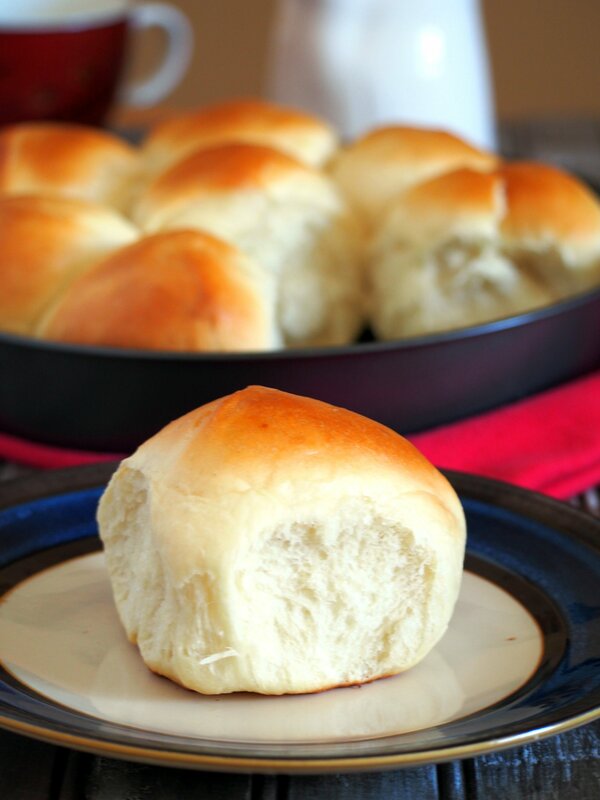 These soft dinner rolls are perfect with any kind of jam or spread but are delicious on their own. Okay, I have to admit that I found it hard to lift a finger and bake these Japanese Milk Buns last week. You see, I just came from a three- week vacation in the Philippines, and I felt like part of me was still there, breathing the fresh morning air and being amidst the haste and noise of the household. I guess this is it. I am homesick. It felt so good to be back home to old, familiar places, eat the food, and the people, most especially to be with people that I have not seen for ages. I decided to bake these Japanese Milk Buns because they remind me of the long trip back and forth: the long walk in airports, the layovers, the wait in the boarding gates and all. These caught my eyes during one of our long layovers, packaged very enticingly in 3s and glistened with toppings of sugar crystals. I savored each bite of the soft buns and promise to tackle copying it when I get back home. I managed to get out of the homesickness rut and here we have it! And I think that baking session did me good as I cannot wait to tackle all the goodies that I had back in the Philippines. My goodness, there are a lot of delicious goodies that I missed! JCo Donuts for one. If only I could eat each and every flavor in the stall, I would. I mean, I could, but I didn’t. But to start, we have these soft and tasty buns that are popular in Asia. 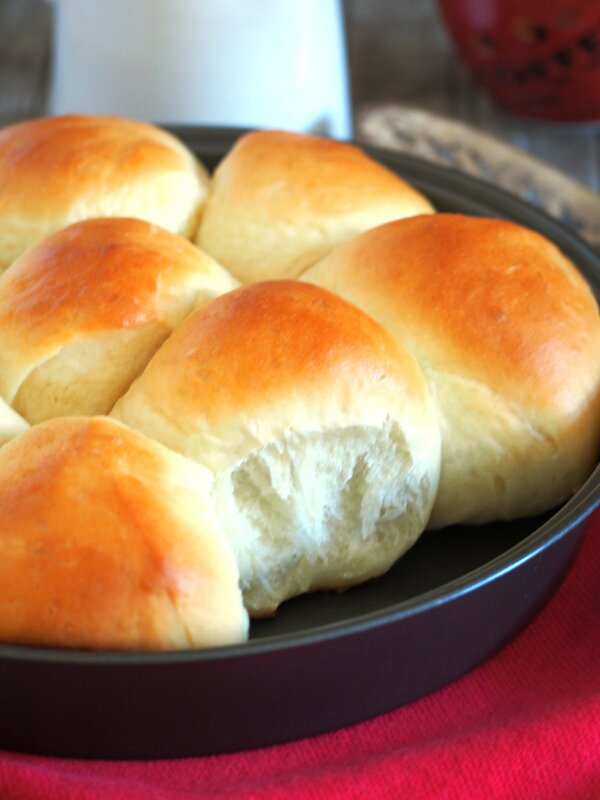 Also known as Hokkaido buns, these are distinct for their melt in your mouth texture. 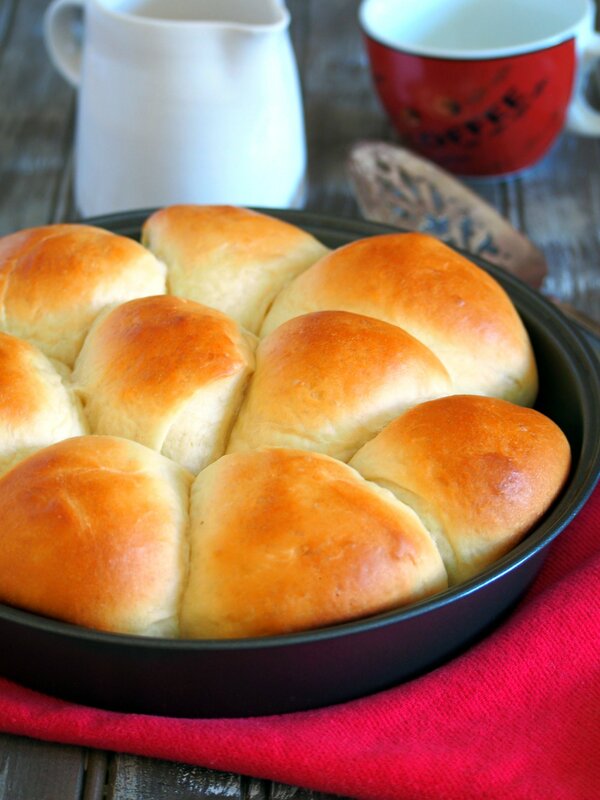 Milkier and tastier than a regular dinner roll, these buns will be your favorite bread to make. Making milk buns starts with a tangzhong or a starter. This is just a simple mixture of water, milk, and flour cooked together to form a paste. Once cool, we mix this paste with the rest of the dough ingredients. The dough ingredients for milk buns are basic and common except for one: the milk powder. I used Nido whole milk powder because that is what we have. Otherwise, there are baker’s dried milk available and skim powdered milk will also work. Just mix the dough ingredients with the tangzhong in a large bowl. Use a big wooden spoon to moisten the dry ingredients and once the dough gathers into a shaggy mass, turn it over in a floured surface. Knead the dough for about 15- 20 minutes. The dough will turn from shaggy to smooth. It will be elastic and can stretch thinly. My favorite way to test this is by using the window pane method. Poke a finger into the dough and the dough should fill the indention in a few seconds by rising back up. I thoroughly enjoyed making bread and I love kneading by hand. Something in the process relaxes me and in the end, makes me feel so fulfilled. 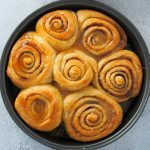 And of course, you will be greatly rewarded with a lovely aroma in your home and a tray of soft, warm buns. Now, how lovely is that? 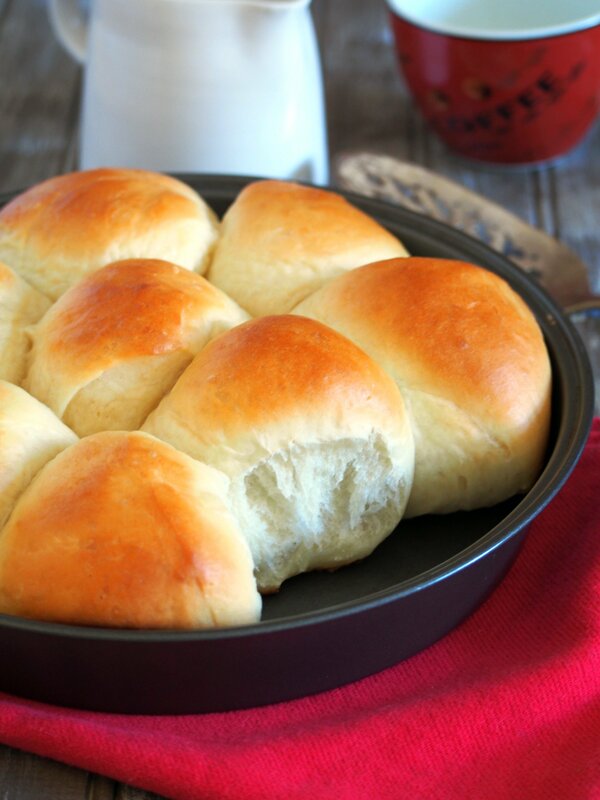 Japanese Milk Buns are soft and tasty dinner rolls perfect for eating on their own or with a pat of butter. In a small pot, stir together milk, water and flour until lump -free. Cook over low heat while stirring continuously until the mixture is thick like a paste. Transfer to a small bowl and let cool. In a large mixing bowl, combine the tangzhong with all the dough ingredients. Use a big wooden spoon to incorporate all the ingredients together until dry ingredients are all moistened. Once the dough has gathered together into a shaggy mass, turn it over into a floured surface. Knead the dough until it is smooth, elastic and soft. This should take about 15-20 minutes. Shape the dough into a ball and place in a lightly greased bowl. Cover the bowl and let the dough rise for 60-90 minutes until puffy. Divide dough into 9 portions, shape each into a ball and place on a greased 9-inch baking pan. 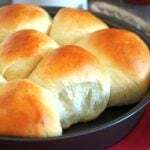 Cover the rolls and let rise again for 50 minutes. Preheat oven to 350 F. Brush the surface of the rolls with milk and bake at 350 for 15-17 minutes, or until the tops are golden. Serve warm. Leftovers can be stored in a tightly covered container at room temperature for up to 2 days. 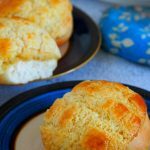 Milk Bread-an easy and simpler variation of making this Asian dinner roll. 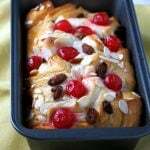 Brioche Braid– this a grand braided brioche and this post give you step by step photos in making it. Pandesal– Filipino version of dinner rolls that is slightly sweet and dusted with bread crumbs on the exterior. 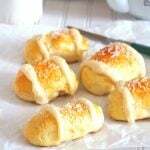 Austrian Buchteln– these are sweet mini buns that are so addictive because they are buttery and so soft. Ensaymada– Filipino version of Brioche that is topped with butter, and sugar, and sometimes cheese. Can I use a bread machine for part of this…? Hi John! You can do the kneading in the bread machine until dough is smooth and elastic 🙂 Enjoy these! A while back I caught part of a T V cooking show about a sweet roll recipe that they were using whole kerrnel corn in it. Looked really good, but can not find a recipe for it anywhere. Do you know this recipe?? Oh my, these buns look so fluffy and delicious! I just have to try them! Hi Natalie! Thank you! these are sooo good! You really have to try it! Is there a Gluten Free version if these buns? Hi Pat! Thanks! Unfortunately, I don’t have a gluten-free version for these. Sorry! These look fantastic. Perfectly fluffy and I bet they are wonderful right out of the oven with butter! Yes, you can 🙂 Enjoy and happy baking! This is my first time in your blog and I think I will be back. Thank you, Odessa! I am so glad that you are here! Happy Baking! Would I be able to make the dough and kneed it a day before I bake? Hi! So excited to try this! Does it have to be milk milk or can I use a milk substitute, like almond milk? Unfortunately, I have not tried using any other milk for this recipe except for cow’s milk. What is milk powder? Do i have to use that even though mulk is already in the recipe?? Hi Harry! Yes you can use a stand mixer, and mix only until the dough gathers in the center and is smooth. The milk has to be warm. Thank you for pointing that out, I will be adding that in the recipe 🙂 Happy baking!